Enter in and enjoy the refreshed and restyled rooms and get the same low affordable rates! We have a new look yet we are the motel lodge in Oxnard California you know and trust. Our guests now enjoy plush new beds wrapped for worry free hygiene, and spacious rooms with hardwood style laminate floors, all designed with the latest contempo furnishings for that designer look. The room includes a tall mini-refrigerator and a microwave for preparing your meals, and a table for your in-room dining. Some rooms come with a contemporary sofa or a second queen bed. The 48 inch flat screen TV gets loads of cable TV channels including Showtime. Your room comes with a six drawer shiny black dresser, matching chairs, and a platform queen sized bed and fresh bedding. The extgra large mini-refrigerator and microwave completes the room for a sweet room with the suite touch. We’ve been busy transforming our formerly classic motel rooms to an updated boutique style, most of our room renovations and restyle are complete. 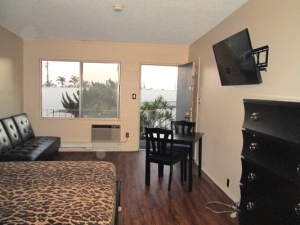 We are centrally located near beaches and downtown Oxnard, attractions, and the Channel Islands.